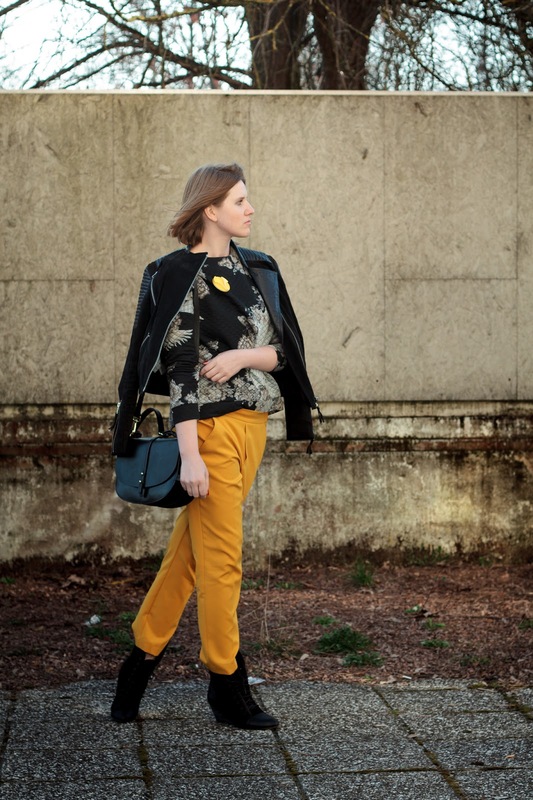 Yellow pants and patterned sweater are my perfect match for a stroll through the city. I like to swap my more basic pieces with something more special like round brooch and leather jacket to make it more interesting. I wonder why I don’t wear brighter pants more often? I bought these in winter and everybody were just giving me a hard time. Everyone was suggesting to pick something darker, perhaps in black or brown shades. Where is the problem? Why are we scared to wear brighter colours in winter time, would we catch a cold easier or maybe we would get more stains all over our clothes? My advice would be to wear coloured pants more often, even in winter. It is scientifically proven that bright colours make us happier so why we don't wear them?